All businesses are not listed and I do not have an approximation on what percentage of businesses are listed but if the market cap of companies becomes greater than the GDP at any point that clearly signals a overvaluation. This is because even if we assume an average net margin of 5% (which is probably not the case) then the businesses are being valued at 20 times earnings implying a huge growth rate which usually is not sustainable. Anything under 50% is also a signal to note that the overall market might be undervalued as unless the country is being invaded or something of similar magnitude is happening the total value of the listed companies cannot be that low. Please note that these over and under valuations can hold on for long periods and is a very loosely held analysis and should not be used for macro betting. 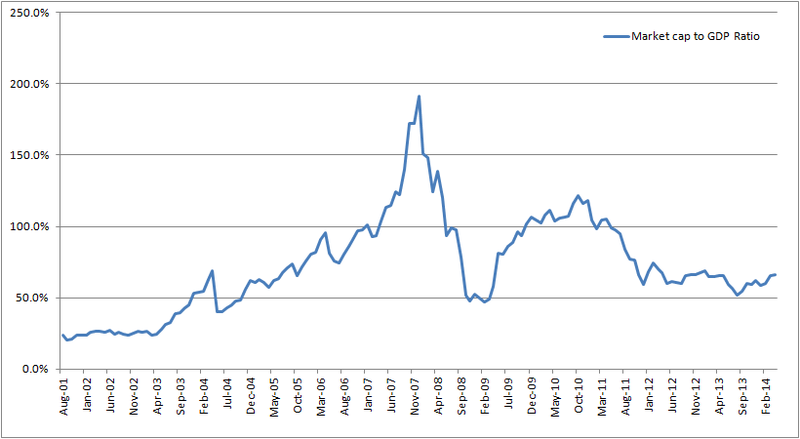 Here is a graph of the BSE total market capitalization to GDP ratio since Aug 2001 till Mar 2014. The second macro factor that can be used is the Index P/E which is a great factor to look at to see what kind of growth the overall market is seeing. A P/E of 20 for a investor looking for 15% return implies a growth of 18% for 10 years on the trot - which is unlikely to happen to all the index companies. A P/E of 15 at the same return implies a growth rate of 13% on the trot for 10 years which is doable if some of the index companies do well. Thus lesser than 15 will indicate a negative overreaction and a 20 will indicate a probable overpricing. 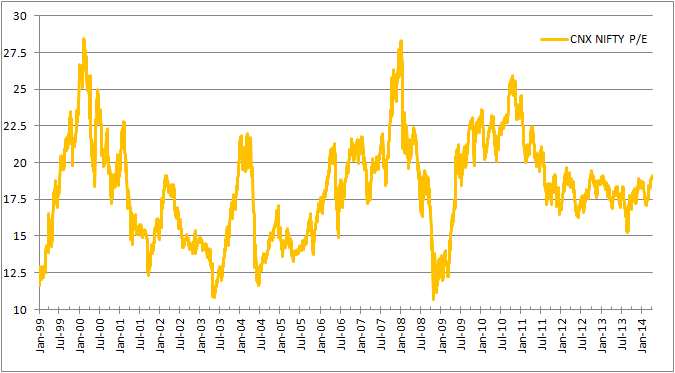 Another important macro factor is inflation which is a big enough beast in itself to deserve its own article. Macro factors provide a general cross check to ensure your trading strategy based on solid value investing and business analysis is sound.